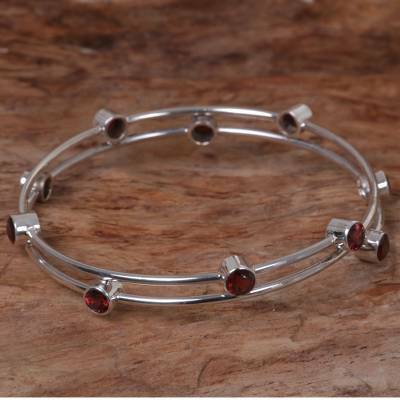 Hand Made Sterling Silver Garnet Bracelet Indonesia, "Orchid Twist in Red"
Balinese artisan Komang Suastra pursues his lifelong passion for jewelry with this stunning bangle bracelet. Handcrafted from sterling silver, it features six carats of garnets that circle the band. Inner circle: 7.5" Inner Circ. You can find garnet bangle bracelet 'Orchid Twist in Red' by Komang Suastra in jewelry categories such as Birthstone Bracelets, Garnet Bracelets, Sterling Silver Bracelets and Bangle Bracelets. Enjoy exploring these sections for other Novica treasures. Excellent quality. Completed my set of garnet ring, earrings, necklace and bracelet. Love it!! !